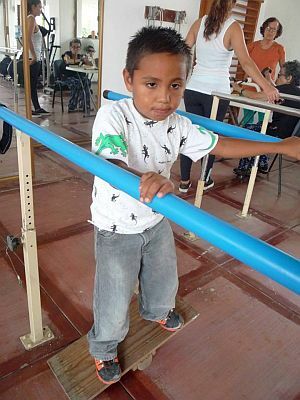 Clinica de Rehabilitación de Vallarta - Santa Bárbara, is located a block off the main highway, directly east of Plaza Peninsula, close to the cruise ship terminal, at Calle Mike Lemus 151 in Colonia Los Cajos. Puerto Vallarta, Mexico - "Look Up or Fall Down" is a good motto for getting around this town of cobbled streets and uneven steps. It's easy to twist an ankle or fall and wrench a wrist or a shoulder. Then what do you need? You need a course of physiotherapy. But what happens if you are poor and cannot afford to pay to help you with your pain or, worse, the pain your child may be suffering? Then you need to get to the clinic that will provide you with the help that you need and will waive the fees. That clinic is Clinica de Rehabilitación de Vallarta - Santa Bárbara, which is one block off of the main highway, directly east of Plaza Peninsula, close to the cruise ship terminal, at Calle Mike Lemus 151 in Colonia Los Cajos. The clinic was established in 1981 and provides excellent physiotherapy services to adults and children who suffer from physical or brain diseases, victims of accidents or children born with malformations. However, the clinic is looking for financial help so that they can expand their services to include language therapy, psychological assistance and neurological treatments. Santa Bárbara is open to the public from 8:00 am to 3:00 pm, Monday to Friday. Consultations by a doctor who specializes in trauma and rehabilitation are available for $300 pesos on Tuesdays and Thursdays and regular treatments cost only $200 pesos. In December 2017, 22 people were unable to pay even these small amounts for their treatments and the clinic provided them free as a social service! Physical therapists are healthcare professionals who help restore function, improve mobility and relieve pain in patients suffering from a disease that limits physical motion or those who are injured. They play a vital role in maintaining and promoting overall fitness and health. Apart from developing a treatment plan to prevent loss of mobility altogether, they also develop wellness programs for patients to live healthier and more active lifestyles. At Clinica de Rehabilitacion Santa Barbara there are 3 fully trained therapists on staff who, last year, helped 900 patients, including children, and provided more than 10,000 treatments of one type or another. If you happen to look up when you should have been looking down, fall and need help to recover, this clinic is one you might want to visit. If you can afford more than the standard $200 pesos a visit, that's $14 loonies or $10 greenbacks, you might consider donating to their cause. It's a good one. The International Friendship Club (IFC) is happy to provide $30,000 pesos a year as a contribution to Clinica Santa Bárbara which, at 200 pesos/visit, means the club paid for 150 treatments for people who were so poor that would otherwise have no relief for their pain. The International Friendship Club raises money to help Clinica Santa Bárbara and about 20 other charities in town as well as its cleft palate program and dental outreach program in Boca De Tomatlan by selling tickets for its renowned IFC Home Tours. For more information, visit ToursForVallarta.com. IFC is also a social club that welcomes visitors and new members to participate in Spanish classes, lectures on Mexican history, Monday movie nights and the ever popular happy hour and dine around on Fridays at five. Please check ye olde website at ifcvallarta.com or come on down to the clubhouse/office located in La Zona Romantica upstairs above the HSBC bank on Insurgentes. Everyone is welcome.